← Greece on the edge? 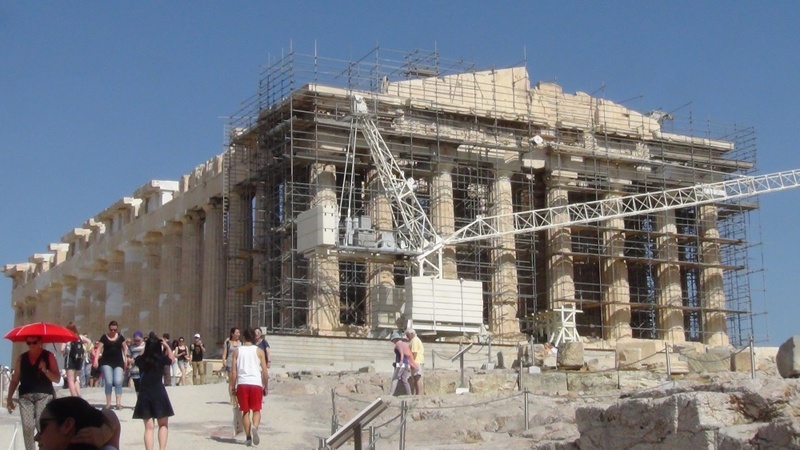 The thought can hardly be original, but visiting the Acropolis during a recent trip to Athens, I couldn’t help but see it as a symbol of the condition of Greece: under renovation, but work currently suspended. At the end of April, the liquidity crisis forced the government to stop payment on public works because the European funding they relied on has dried up. Greece is being punished by the obstinate, pig-headed, anti-democratic plutocracy of the EU and the IMF for the crime of electing the wrong government, a government that opposes austerity as an unworkable policy that creates unpayable debts and has indefensible consequences for the mass of the people. The group I travelled with was organised by Johnna Montgomerie of the Political Economic Research Centre (PERC) at Goldsmiths College, who has written about it here. The trip provided the opportunity for the first serious filming for a new collaboration with Lee Salter. Money Puzzles is to be a documentary about money and debt, a sequel to our previous film together, Secret City (2012). An exposé of the City of London—the square mile at the centre of the capital that’s been called ‘a state within a state’—Secret City was made in the wake of the Occupy movement, which concentrated attention on the City as the Vatican of financial capitalism. Money Puzzles is being made at a moment when a new anti-austerity politics is becoming a reality in Greece, Spain and elsewhere, so it reverses the perspective and looks outwards beyond the citadel of finance, conscious that in the UK, the Tories’ election victory makes the challenge ever more urgent. The video of the trip to Greece (which will later be incorporated into the final film) is here: Greece on the Edge? This entry was posted in Capitalism, Cultural Politics, Documentary, Politics, Video and tagged Capitalism, Documentary, Greece, Money, Politics. Bookmark the permalink.